Palladium is a rare and shiny silvery-white metal only recently discovered in 1803 and is part of the family of metals known as the “platinum group”, as they share similar chemical properties. Of all the platinum group metals, palladium is unique for having the lowest melting point while at the same time being the least dense. Like platinum, palladium is typically used in the production of catalytic converters for the automotive industry, and is found in a wide range of electronic products including cell phones, computers, capacitors, flat-screen televisions. 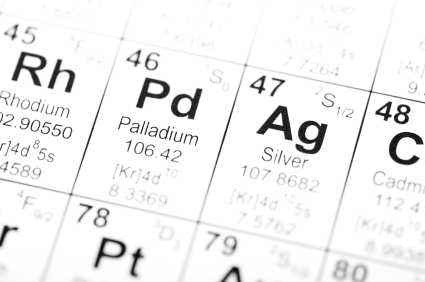 Beyond consumer products, palladium is used in dentistry, medicine, and groundwater treatment, as well as playing a key role in the creation of feul cells. Palladium is also recycled from scrapped catalytic converters, as even small amounts of the metal can be salvaged at a profit. Palladium’s many emerging usages relate to the fact that it is a solid metal, but it absorbs hydrogen gas. Palladium can absorb up to 900 times its own volume of hydrogen. It also absorbs deuterium, a heavier form of hydrogen with an extra neutron in its nucleus. Since palladium absorbs hydrogen, it is most widely used in autocatalysts to reduce air pollution, but it also used for hydrogen purification and can be used as a catalyst in feul cell batteries. This means that as the demand for feul cell technology grows, so too will the industrial demand for palladium. A significant amount of the world’s annual supply of palladium comes from Russia, the United States, Canada, and South Africa. The amount and status of Russian palladium supplies are kept secret. In the past, Russia has withheld supplies of palladium from world markets for its own political and/or economic gain, resulting in very large and fast fluctuations in palladium prices. The USA has only one primary palladium producer, the Stillwater Mining Company, which operates two mines in southern Montana. At that location, the palladium ore bearing layer called the J-M (Johns-Manville) Reef is the richest known palladium deposit currently being exploited anywhere in the world. Active mining from this location produces a high grade ore containing a palladium:platinum ratio of just over 3:1. After mining, the ore is refined by Stillwater at a site near Columbus, Montana, to a purity of 60% PGMs, then shipped to Johnson Matthey for final refining of palladium, platinum and other metals at a facility in New Jersey. It is the historical range of prices, and the price differential between palladium and platinum at any given time, that gives palladium its attractive investment potential. The price of palladium has been, and could again be, extremely volatile, providing investors with a significant opportunity for speculative profit.